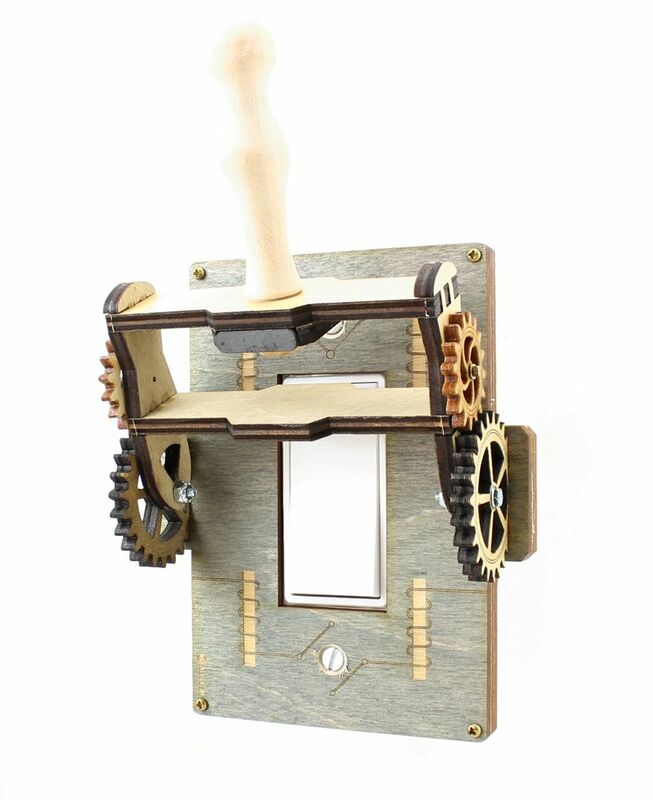 AKA "The Frankenstein Light Switch"
Comes as shown: Gray Plate and tan Gears, Electrical Blue print styling that wraps around break jaws to give it an authentic old fashion knife/throw switch look. Light switch cover is completely functional. Pivot the handle on the stationary gear hinge to flip the rocker switch on and off. Magnets are placed on both sides to hold the switch in position. The secondary smaller gear rotates along the gear hinge as it moves up and down. Light switch cover goes over any standard and medium size residential single rocker light switch and installs over the existing plastic cover using the existing screws to fasten to the wall (in some cases longer screws may be required, in this case we have supplied two extra longer screws).